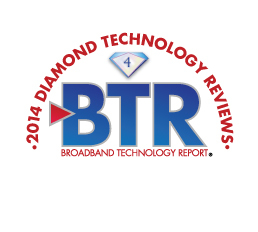 Sep 10, 2014 (Mount Laurel, NJ) – TelVue® (OTC: TEVE) is pleased to announce the TelVue HyperCaster® 4K IP Broadcaster was awarded Four Diamonds in this year’s Broadband Technology Report (BTR) Diamond Technology Reviews, for being “an excellent product, easy to operate,” according to the judges. BTR criteria used in the Diamonds rankings include, first and foremost, unique technology or application thereof, innovation, ease of use, efficiency, reliability and contribution to profitability. “The HyperCaster 4K is the first affordable SD, HD and 4K TV-station-in-a-box on the market. We are pleased that the distinguished BTR judges recognize its quality and ease of use,” said TelVue President and CEO, Jesse Lerman. The TelVue HyperCaster 4K is the latest version of TelVue’s flagship HyperCaster IP Broadcast Servers, which previously garnered industry awards for innovative, flexible and reliable content ingest, management and multi-format (SD, HD and 4K) playout features. The HyperCaster 4K can be used in all broadcast, Internet OTT, Cable, Satellite and Digital Cinema applications. The HyperCaster 4K will be on display at the upcoming SCTE Cable Tec Expo in Denver, Sept. 22-25.